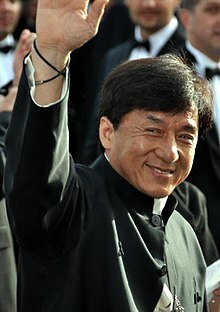 Datuk Chan Kong-sang SBS MBE PMW (Chinese: 陳港生; born 7 April 1954), known professionally as Jackie Chan, is a Hong Kong martial artist, actor, film director, producer, stuntman, and singer. He is known for his acrobatic fighting style, comic timing, use of improvised weapons, and innovative stunts, which he typically performs himself, in the cinematic world. He has trained in wushu or kungfu and hapkido, and has been acting since the 1960s, appearing in over 150 films. Chan is one of the most recognizable and influential cinematic personalities in the world, gaining a widespread following in both the Eastern and Western hemispheres, and has received stars on the Hong Kong Avenue of Stars, and the Hollywood Walk of Fame. He has been referenced in various pop songs, cartoons, and video games. He is an operatically trained vocalist and is also a Cantopop and Mandopop star, having released a number of albums and sung many of the theme songs for the films in which he has starred. He is also a globally known philanthropist, and has been named as one of the top 10 most charitable celebrities by Forbes magazine. 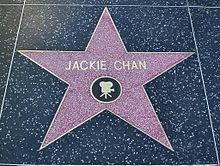 In 2004, film scholar Andrew Willis stated that Chan was "perhaps" the "most recognised star in the world". In 2015, Forbes estimated his net worth to be $350 million, and as of 2016, he was the second-highest paid actor in the world. ↑ "Civil And Miscellaneous Lists : Recipients of Hong Kong Special Administrative Region Honours and Awards Grand Bauhinia Medal (G.B.M.)". www.info.gov.hk. Retrieved 28 February 2018. ↑ "Jackie Chan Goes To The Oscars – ETHOZ". ETHOZ. 22 December 2016. ↑ "Jackie Chan Biography – life, family, children, parents, name, story, school, mother, young". www.notablebiographies.com. 1 2 Willis, Andrew (2004). Film Stars: Hollywood and Beyond. Manchester University Press. p. 4. ISBN 9780719056451. 1 2 "Biography of Jackie Chan". Biography. Tiscali. Archived from the original on 4 February 2010. Retrieved 28 February 2012. 1 2 "Jackie Chan Battles Illegal Wildlife Trade". Celebrity Values. Archived from the original on 13 March 2012. Retrieved 28 February 2012. ↑ "Biography of Jackie Chan". StarPulse. Archived from the original on 18 January 2012. Retrieved 28 February 2012. ↑ "Men of the Week: Entertainment, Jackie Chan". Biography. AskMe. Archived from the original on 3 March 2012. Retrieved 28 February 2012. ↑ "Real Lives: Jackie Chan". Biography. The Biography Channel. Archived from the original on 8 September 2013. Retrieved 28 February 2012. 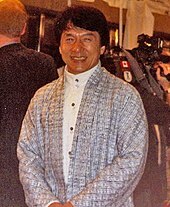 1 2 "Jackie Chan, a martial arts success story". Biography. Fighting Master. Archived from the original on 3 March 2012. Retrieved 29 February 2012. ↑ Pollard, Mark. "Snake in the Eagle's Shadow". Movie review. Kung Fu Cinema. Archived from the original on 3 September 2012. Retrieved 29 February 2012. ↑ Pollard, Mark. "Drunken Master". Movie review. Kung Fu Cinema. Archived from the original on 9 December 2012. Retrieved 29 February 2012. ↑ Rovin, Jeff (1997). The Essential Jackie Chan Source Book. Simon and Schuster. p. 148. ISBN 9781439137116. 1 2 3 "【ジャッキーチェン興行成績】 第12回：日本での興行収入". KungFu Tube (in Japanese). 2012. Retrieved 21 November 2018. ↑ "Sammo Hung Profile". Kung Fu Cinema. Archived from the original on 29 May 2007. Retrieved 29 February 2012. ↑ "Yuen Biao Profile". Kung Fu Cinema. Archived from the original on 15 April 2007. Retrieved 29 February 2012. ↑ Elley, Derek (23 January 1995). "More Than 'The Next Bruce Lee'". Variety. ↑ "Jackie Chan (Acteur chinois) - France". JP's Box-Office. Retrieved 28 November 2018. 1 2 "Jackie Chan (Acteur chinois) - Europe". JP's Box-Office. Retrieved 28 November 2018. 1 2 "Jackie Chan Movie Box Office Results". Box Office Mojo. Retrieved 28 November 2018. ↑ Raffi (15 September 1998). "Rush Hour Review". Film Review. BeijingWushuTeam.com. Retrieved 29 February 2012. ↑ Gerstmann, Jeff (14 January 2007). 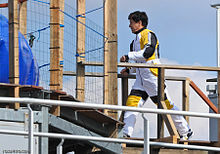 "Jackie Chan Stuntmaster Review". Gamespot. Archived from the original on 7 July 2012. Retrieved 29 February 2012. ↑ Lclem (16 May 2007). "Jackie Chan and Jet Li Will Fight In 'Forbidden Kingdom'". CountingDown. Archived from the original on 11 October 2007. Retrieved 29 February 2012. ↑ "【ジャッキーチェン興行成績】 第8回：香港での興行収入". KungFu Tube (in Japanese). 2010. Retrieved 29 November 2018. ↑ "【ジャッキーチェン興行成績】 第10回：韓国での興行収入". KungFu Tube (in Japanese). 5 September 2010. Retrieved 7 December 2018. 1 2 "Jackie Chan - Box Office". The Numbers. Retrieved 8 December 2018. ↑ "Jackie Chan". Maoyan. Tianjin Maoyan Culture Media. Archived from the original on 28 November 2018. Retrieved 28 November 2018. 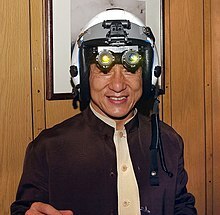 ↑ "Jackie Chan (Acteur chinois)". JP's Box-Office. Retrieved 28 November 2018. ↑ "Jackie visits the University of Cambodia". 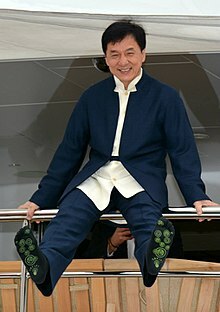 jackiechan.com. Archived from the original on 10 March 2012. Retrieved 1 March 2012. ↑ "Jackie Chan's Daughter Is Homeless & Living Under a Bridge Due To Her 'Homophobic' Parents". ↑ "Jackie Chan refused to help his daughter's mother, says lawyer". The Straits Times. ↑ 吳綺莉復出 林鳳嬌不爽？ Archived 9 February 2013 at Archive.today. Worldjournal.com (17 July 2011). ↑ Asian Film Foundation – 05/13/05 – Are these Asian stars married or not? Archived 3 October 2006 at the Wayback Machine. Asianfilm.org. ↑ "Dragon Lord". Love HK Film. Retrieved 14 April 2011. ↑ "Dragon Lord (DVD Description)". Amazon.com. Retrieved 12 April 2011. ↑ David Everitt (16 August 1996). "Kicking and Screening: Wheels on Meals, Armour of God, Police Story, and more are graded with an eye for action". Entertainment Weekly. Retrieved 12 April 2011. ↑ Jackie Chan. "Jackie's Aches and Pains: It Only Hurts When I'm Not Laughing". Random House. Retrieved 19 December 2012. 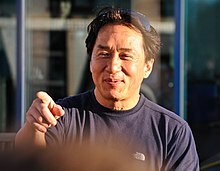 ↑ "Jackie Chan re-injures back while filming". The Star. Malaysia. 27 August 2007. Archived from the original on 25 January 2012. Retrieved 29 February 2012. ↑ "Jackie Chan From Hong Kong to Receive Stunt Award". Xinhuanet. 16 May 2002. Archived from the original on 25 February 2012. Retrieved 29 February 2012. ↑ "20 Years Later, Rush Hour Is Still a Buddy-Cop Gem". Rotten Tomatoes. 18 September 2018. ↑ "Jackie Chan given Datuk title". Yahoo! Entertainment Singapore. 1 February 2015. Archived from the original on 18 February 2015. Retrieved 2 February 2015. ↑ "Protestors blast Jackie Chan for criticizing Taiwan elections". People News. 18 June 2008. Archived from the original on 29 February 2012. Retrieved 1 March 2012. ↑ Le-Min Lim (22 April 2009). "Jackie Chan Faces Film Boycott for Chaotic Taiwan Comments". Bloomberg. Archived from the original on 19 October 2008. Retrieved 1 March 2012. ↑ Barre, Geoffroy (25 February 2016). "David Cheng tells us how he joined forces with Jackie Chan". Automobile Club de l'Ouest. Retrieved 18 June 2017. ↑ "Jackie Chan DC Racing announces new partners and new additions to all star driver line up". Motorsport.com. 27 October 2016. Retrieved 20 June 2017. ↑ "Jackie Chan cheered us on to a historic Le Mans result – Cheng". Crash.net. 19 June 2017. Retrieved 20 June 2017. ↑ "Jackie Chan looks to bequeath half of wealth". The Financial Express. Reuters. 29 June 2006. Archived from the original on 2 June 2016. Retrieved 1 March 2012. ↑ "Japan Earthquake Song Music Video". 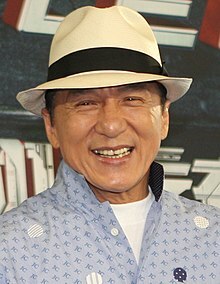 Jackiechan.com. Archived from the original on 10 March 2012. Retrieved 1 March 2012. ↑ "Jackie Chan and HK celebrities to raise funds for quake victims in Japan". Xinhua News Agency. 25 March 2011. Archived from the original on 2 January 2012. Retrieved 1 March 2012. ↑ "Jackie Chan donates 2.3mil baht to flood victims". The Nation. 24 January 2017. Retrieved 25 January 2017. 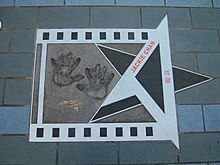 ↑ "Hollywood Walk of Fame – Jackie Chan". walkoffame.com. Hollywood Chamber of Commerce. Archived from the original on 2 August 2017. Retrieved 11 February 2018.